The first wave of the 21 additional countries that are getting the new iPad this month started today. While most were smaller markets, South Korea, one of the most technologically advanced countries in the world, finally got access to the new iPad. 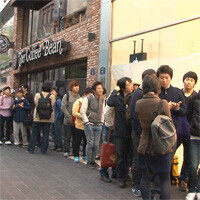 As you can see in the video below, an extremely long line that wrapped around the block developed out in front of a local authorized reseller. Once it was time to open, employees ran the line cheering and clapping to build the excited much like what is seen at Apple Stores worldwide on release day. Overall, the launch looks like it went off without incident. People were able to come in, buy their new iPad, pose for some pictures, and get home to play with their new gadget. The new iPad rollout will continue on Friday, April 27th with nine more countries. At that point the new iPad will be available in 56 countries worldwide. Thats actually not true. Only the LTE new ipad has that. wait days.... finally get in the door and no discount, just an applaud... F%$k that!!! Eh, looks like every other launch of apples latest novelty. So yes, stupid. Damn some phonearena staff must have loved Apple so much and was on an infraction spree on here.. The world is doomed by evil inequities.